Background: After femoral neck fracture, insufficient blood supply to the femoral head can cause avascular necrosis of this region. This can lead to increased treatment difficulty, and may greatly influence the recovery of hip joint function. Core decompression with bone grafting is a common treatment for avascular necrosis of the femoral head. 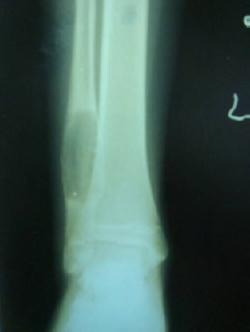 An implanted porous tantalum rod, which is a bone trabecula-like metal implant that is used to support the weight-bearing area of necrotic bone, can prevent further collapse of the necrotic area. This strategy has led to favorable effects in the early treatment of avascular necrosis of the femoral head. 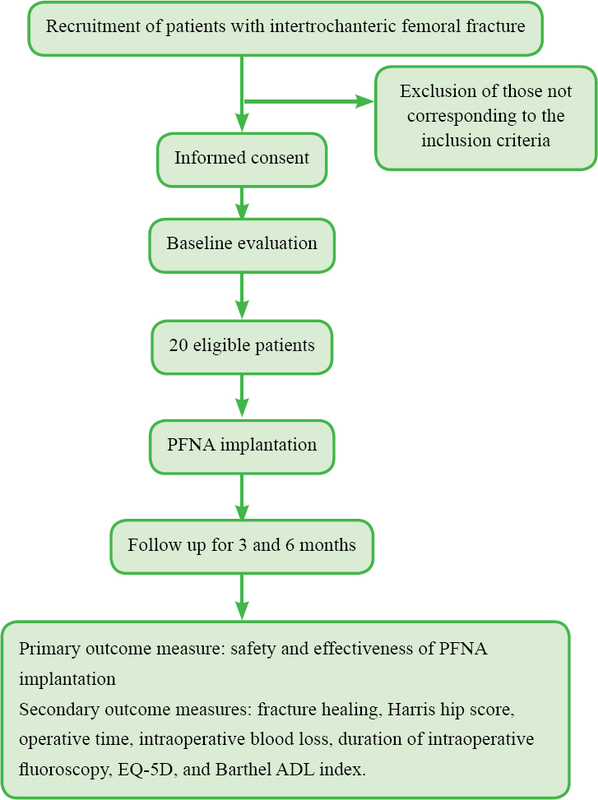 However, few randomized controlled studies have reported on porous tantalum rod implantation for treatment of avascular necrosis of the femoral head after femoral neck fracture surgery. We hypothesized that, compared with core decompression alone, core decompression with porous tantalum rod implantation would have a more beneficial effect of the hip joint function of patients with avascular necrosis of the femoral head after femoral neck fracture surgery. Methods/Design: This is a prospective, single-center, randomized controlled, open-label trial, which will be performed in the Department of Orthopedic Trauma, Qinghai University Affiliated Hospital, China. A total of 100 patients with avascular necrosis of the femoral head after femoral neck fracture surgery will be randomly assigned to undergo core decompression and porous tantalum rod implantation (experimental group, n = 50) or core decompression only (control group, n = 50). All patients will be followed up for 1 year. The primary outcome measure is the percentage of patients (of the total number of patients in each group) whose hip joint function is graded as excellent as per Harris hip scores 12 months after surgery. This value will be used to evaluate the recovery of hip joint function. 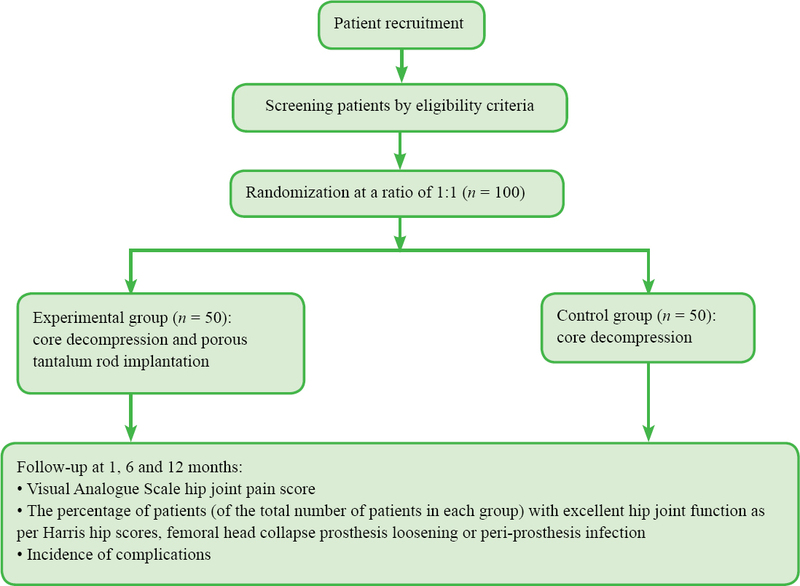 Secondary outcome measures include (1) the percentage of patients with excellent hip joint function, prior to and 1 and 6 months after surgery (of the total number of patients in each group); (2) hip joint pain score on a Visual Analogue Scale prior to and 1, 6, and 12 months after surgery, which will be used to evaluate the severity of pain; (3) the percentage of patients presenting with femoral head collapse, prosthesis loosening, and peri-prosthesis infection 6 and 12 months after surgery, which will be used to evaluate the biocompatibility of the biomaterial with the host site; (4) incidence of complications 6 and 12 months after surgery, which will be used to evaluate the safety of porous tantalum rod implantation. Discussion: This study is powered to validate the biocompatibility and therapeutic effects of porous tantalum rods in the treatment of avascular necrosis of the femoral head after femoral neck fracture, with the hopes that this novel surgical method represents a superior treatment for this disease. Trial registration: ClinicalTrial.gov identifier: NCT02877472; registered on 19 August 2016. Ethics: This study protocol has been approved by the Medical Ethics Committee of Qinghai University Affiliated Hospital of China (approval number: QHY1016B) and will be performed in accordance with the guidelines of the Declaration of Helsinki, formulated by the World Medical Association. Informed consent: Signed informed consent regarding trial procedure and treatment will be obtained from each patient. Background: A unified standard for cervical pedicle screw placement does not currently exist; therefore, it is difficult to quantitatively evaluate the clinical effects of the technique. Digital navigation can provide a reference for accurate and safe location, orientation, and placement of cervical pedicle screws. We hypothesized that compared with partial cervical lamina excision or the pipeline-dredge discharge method, digital navigation can greatly increase the accuracy and safety of cervical pedicle screw placement. Methods/Design: This was a prospective, single-center, randomized controlled, open-label trial. Seventy-six patients with cervical spine fracture scheduled to receive treatment in the Department of Orthopedics, Affiliated Hospital of Nantong University, China were randomly divided into three groups to undergo cervical pedicle screw internal fixation. Patients in the cervical lamina partial excision group (n = 26, 160 screws) underwent partial cervical lamina excision and cervical pedicle screw internal fixation; those in the pipeline-dredge discharge group (n = 27, 156 screws) underwent pipeline-dredge discharge and cervical pedicle screw internal fixation; and those in the digital navigation group (n = 23, 162 screws) underwent digital navigation-assisted cervical pedicle placement. All patients were evaluated at 12 and 36 months. The primary outcome was the percentage of screws graded I when evaluating the penetration degree of the cervical pedicle screws, which evaluates the accuracy of screw placement, 12 months after internal fixation. Secondary outcomes included: (1) the percentage of screws graded I when evaluating the penetration degree of cervical pedicle screws 36 months after internal fixation; (2) bony fusion rate of the atlantoaxial joint, used to evaluate fracture healing, 12 and 36 months after internal fixation; (3) Visual Analogue Scale spine score, used to evaluate cervical neck pain, prior to and 12 and 36 months after internal fixation; (4) American Spinal Injury Association Classification, used to evaluate improvement in neurological function, prior to and 12 and 36 months after internal fixation; and (5) adverse events, used to evaluate the safety of each pedicle screw implantation method, 12 and 36 months after internal fixation. Discussion: This trial protocol compared the effects of three cervical pedicle screw internal fixation methods for the treatment of cervical spine fracture, and investigated and compared the accuracy and safety of digital navigation-assisted cervical pedicle screw placement with partial cervical lamina excision and pipeline-dredge discharge. We hoped to provide quantitative evidence for the clinical use of digital navigation in orthopedics, especially in cervical pedicle screw placement. Trial registration: ClinicalTrial.gov identifier: NCT02880839; registered on 19 August 2016. Ethics: This trial protocol has been approved by Medical Ethics Committee, Affiliated Hospital of Nantong University, China, and was performed in accordance with the guidelines of the Declaration of Helsinki, formulated by the World Medical Association. Informed consent: Signed informed consent regarding trial procedure and treatment was obtained from each patient. Background: Anesthesia, surgery, and other nociceptive stimuli affect stress and hemorheological indices, impact physiological function, decrease immune function, and thereby influence recovery of hip joint function in elderly patients who undergo total hip replacement. Previous anesthesia methods for hip replacement in elderly patients include general, lumbar puncture, or epidural anesthesia alone. A combined nerve block is more suitable for total hip replacement in the elderly because of the safety and reliability of the method. 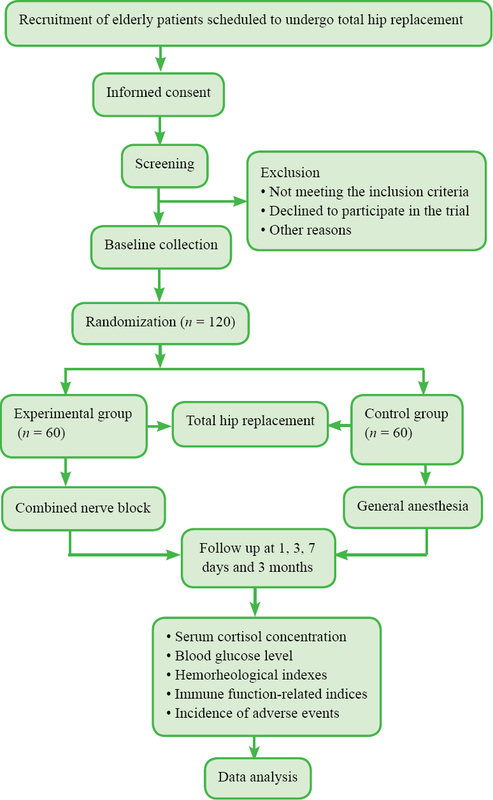 In this study, we hypothesized that a combined nerve block is superior to any previous anesthesia method alone for total hip replacement in the elderly. Specifically, we hypothesized that intraoperative stress, hemorheological indices, postoperative immune function, and incidence of postoperative complications would be more favorable using a combined nerve block compared with previous anesthesia methods. Methods/Design: This is a prospective, single-center, randomized controlled, open-label trial, which will be performed at Qinghai University Affiliated Hospital, China. A total of 120 elderly patients scheduled to undergo total hip replacement will be randomly assigned to undergo a combined nerve block (involving lower lumbar plexus, sciatic nerve, and paraspinal nerve L 1-2 ) (experimental group, n = 60), or general anesthesia (control group, n = 60). All patients will be followed up at 3 months. The primary outcome is serum cortisol concentration during surgery, as a measure of intraoperative stress. Secondary outcomes include serum cortisol concentration prior to anesthesia, and prior to and immediately after surgery; blood glucose level prior to anesthesia, and prior to, during, and after surgery, used to evaluate stress during different times. In addition, immune function-related indices including absolute leukocyte count, absolute neutrophil count, interleukin-1, interleukin-6, tumor necrosis factor-α, and T-lymphocyte subset levels prior to anesthesia, immediately after surgery, 1, 3, 7 days, and 3 months after surgery, will be used to evaluate patients' immune function after surgery. Hemorheological indices including electrocardiogram, pulse, systolic pressure, diastolic pressure, heart rate, blood gas analysis prior to anesthesia, and during and after surgery will be used to investigate changes in blood-related indices. Lastly, incidence of adverse events 1, 3, 7 days, and 3 months after surgery will be used to evaluate postoperative complications. Discussion: This study will investigate the effects of a combined nerve block versus general anesthesia on intraoperative stress and postoperative immune function in elderly patients who undergo total hip replacement. This study will provide objective evidence for selection of anesthesia method for total hip replacement in the elderly, with the aim of reducing intraoperative risks and postoperative complications. Trial registration: ClinicalTrial.gov identifier: NCT02884388; registered on 19 August 2016. Ethics: This trial has been approved by Ethics Committee, Qinghai University Affiliated Hospital, China (approval number QHY1017D) and will be performed in accordance with the Declaration of Helsinki, formulated by the World Medical Association. Informed consent: Signed informed consent will be obtained from the patients or their relatives. One of the concerning problems with total joint arthroplasties is a need for postoperative blood transfusion. Currently, evidence is gathered that allogenic blood transfusion has more disadvantages than previously thought. It is an independent risk factor that boosts infection rate, it increases total cost of joint arthroplasty and amplifies the risk of fluid overload as well as increases length of hospital stay. In the search for factors that may contribute to influencing the need for blood transfusion, tranexamic acid has been tested. Currently, it has a well-documented effect on reduction of intra- and postoperative blood loss and transfusion requirements in patients undergoing total knee arthroplasty. In this brief review, we will discuss documented use of tranexamic acid in total joint arthroplasties, focusing on the hip joint. Perioperative blood loss is a major complication of total hip arthroplasties. The use of tranexamic acid (TXA) is considered during total hip arthroplasties for its antifibrinolytic effects, reducing blood loss and anemia following these surgeries. In order to compare the efficacy of different forms of TXA administration on reducing blood loss, Zhou et al. have designed a randomized, controlled, double-blinded clinical trial comparing the use of intravenous TXA versus topical TXA administration. By employing a large sample size and an effective paired study design, the protocol of Zhou et al. may be effective in producing significant results on the relative efficacy of these two forms of TXA administration for reducing blood loss. This commentary addresses the strengths and drawbacks of this protocol, while also highlighting potential areas for improvement. With corrections, the study could prove clinically valuable to both patients and surgeons, since the use of topical TXA may result in fewer thromboembolic complications than intravenous administration. Chondromyxoid fibromas are rare, benign tumours accounting for < 1% of primary bone neoplasms, and most commonly affected in the second or third decades of patient's life. 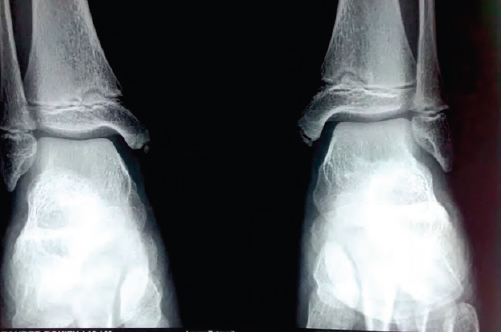 We reported one such case of chondromyxoid fibroma in the distal fibula of a 15-year-old girl. The patient was managed with lower 3 rd fibulectomy & fibular turnoplasty from middle 3 rd fibula with one-third tubular plate fixation for stabilization followed by bone grafting. The patient is disease-free since 3 years.